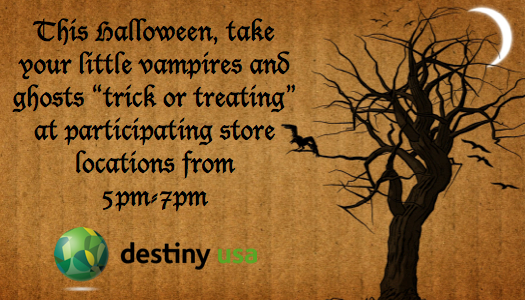 If you would like to stay out of the cold and rain this Halloween season, you can do your " trick or treating " at the Destiny USA mall in Syracuse NY: See the article below that was posted on the Destiny USA's website. Syracuse, NY- Destiny USA will celebrate Halloween this season with a safe and dry environment trick or treat alternative or addition for children. On Wednesday, October 31 from 5:00pm-7:00pm, participating store locations will have candy and treats available to kids in costume. Destiny USA’s guest services locations will also be distributing candy on the first level underneath the food court and on the second level in the canyon area. Participating stores will hang an orange poster on their storefronts to let visitors know they can trick or treat while supplies last.